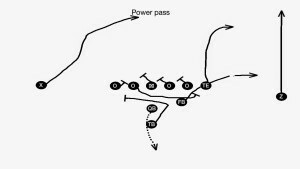 The “Power Pass” is a play action flood concept used by most teams and is a valuable tool for a run heavy offense to take advantage of the defense’s aggressiveness in stopping the run game. 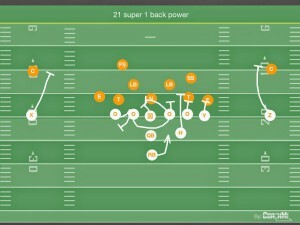 There are some variations but you will typically see a deep route from a WR, an out breaking route from a TE on the playside, and a FB flat route from the backfield. 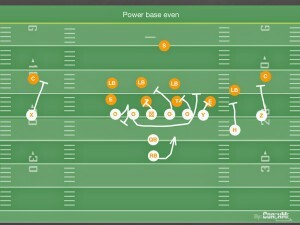 The QB and RB will sell a hard run fake to the play side. This is a part of our base offense and we usually see a wide open TE or FB because of the defense’s reaction to what looks like a run play. I saw Michigan run this type of concept early in the Citrus Bowl against Florida. One interesting thing Michigan did was to run it from a heavy personnel group. They were in what I call “Jumbo” which is 22 personnel (2 backs, 2 TEs, 1 WR). By using a TE on the backside of the play (rather than an X WR split out wide) it allows a short drag route to immediately fill space vacated by the playside LB. 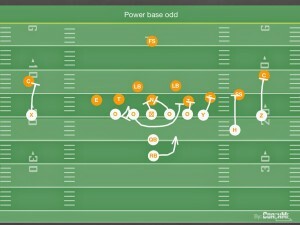 Here is a diagram of the play from double tight. In the clip below I give a brief summary and analysis of the play. 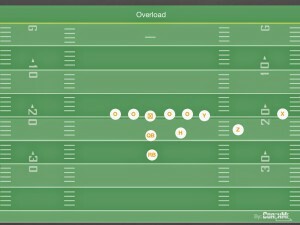 You will see the corner take the WR, and the safety play the Right TE on the out right. The Sam LB triggers on the run fake but does an excellent job of recognizing the FB flat route and redirecting to cover him. The Mike LB fills and continues to rush at the QB. With the Safety and Sam covering other players, and the Will and backside secondary players trailing by alignment, it leaves a natural hole for the left TE to drag in to. 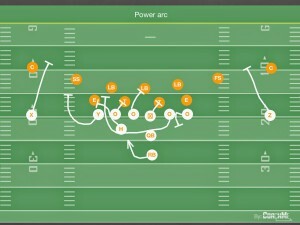 There are different ways to protect power pass, many teams will pull a guard to sell the exact same blocking action. Michigan uses the simplest and safest way to protect it by sliding their entire OL to the left away from the run fake. 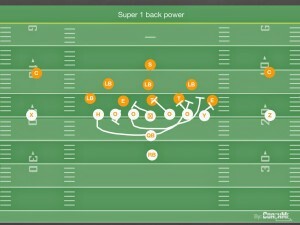 This ensures gap integrity across the front from play side B gap to the QB’s backside. The RB is responsible for picking up the play side edge pressure by blocking the DE after his fake. Posted in College Film, Offense, Play Action Game, Pro. This is a great answer as teams load the box, or crash down hard in an attempt to take away Power. This play gets better and better with the more players the defense aligns on the LOS. More guys on LOS, less guys who can cover. We even got some teams into an alignment where their end man had to take on FB as well as cover him man to man… that is like stealing, if he can stuff our FB he can’t cover him, if he can cover him, we are getting easy kick outs. Either way we win. 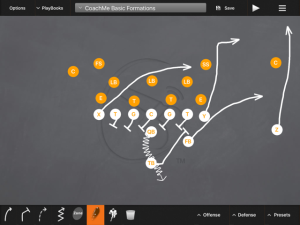 I can’t stress enough how helpful the OL play is on selling play action. 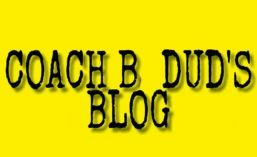 We do not pretend to block power, we full on block power, we just don’t drive anyone past 2 yards down field. Posted in Offense, Play Action Game, Pro.